There is a distinct charm to “To Be or Not to Be” that is unlike any other film I have seen. The main reason for this is that this is one of the few films that turned the Nazis and Hitler into a farce while we were in the middle of World War II. There were plenty of films that depicted the Nazis as evil and the worst thing that has ever happened to the world, especially during the mid-1940s, but little to no comedies. The only other that comes to mind is Charlie Chaplin’s “The Great Dictator,” which is interesting since both films were made by filmmakers who had direct stakes in Hitler’s march through Europe. Director Ernst Lubitsch, originally from Poland, made a movie that not only treated Hitler like a bad joke, but also shows the strength and resolve of the Polish people. “To Be or Not to Be” is enduring because of smaller characters, like the Polish bit-player in a theater troupe who quotes “Hamlet” when he witnesses the destruction the Nazis cause. Little moments like that which show the vulnerable side while also juggling the comedic aspect makes this a movie worth seeing. The film follows a theater troupe based in Warsaw, Poland who want to put on a play that satirizes the Nazis and Hitler but ends up getting cancelled the night the Germans invade Poland. Some time after this, a professor-turned-spy for the Nazis secretly gets his hands on a list of names associated with the Polish underground resistance movement and heads back from England to Poland to give the Gestapo the names. A young Polish pilot, Lt. Sobinski (Robert Stack), hears about the professor’s plans and heads back to Poland to stop him from reaching the Gestapo. The first person he reaches out to is the leading lady of the theater troupe, Maria Tura (Carole Lombard), which quickly involves her husband Joseph (Jack Benny) and the rest of the troupe as they masquerade as Nazis and the Gestapo to fool just about everyone else. The star of the movie is Jack Benny, who takes absolute delight in his ability to fool everyone with his acting talents, proving to himself that he is the greatest actor alive. The best scenes are with him, pretending to be the professor, interacting with the head of the Gestapo, Col. Ehrhardt (Sig Ruman). These two have the most inflated egos and take every opportunity to pump more air into theirs just to impress the other. 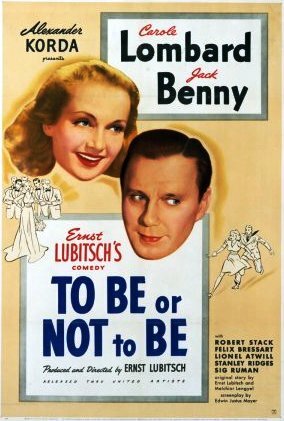 Overall, I had a lot of fun with “To Be or Not to Be.” The plot is a bit confusing at times, especially once Sobinski lands back in Poland, but once Jack Benny has to go undercover as a Nazi spy, everything turns into comedic gold. Yet the film never loses its human charm with its representation of the Polish people in the face of such adversity. Without saying too much or too little, it says everything that needed to be said about Hitler and the Nazis.